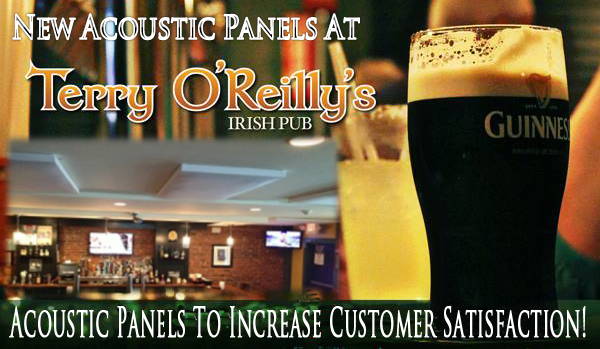 Terry O’Reillys Irish Pub, Newton’s popular pub, was just retrofitted with new “Pure White” acoustic panels on the ceiling to absorb restaurant noise within one section of the pub. Owner and managers in the restaurant knew that they needed to improve the acoustics within the pub so that customers will be satisfied with eating near the bar. “Most restaurant owners don’t realize how loud their restaurant is until they get the multiple complaints,” says New England Soundproofing owner Joseph Drago, head consultant for the O’Reilly Acoustic Project. “Luckily, the owners of Terry O’Reillys realized it and did something about it.” New England Soundproofing customized multiple white acoustic panels for the pub area of the restaurant. “It made a very big improvement and customers are so much happier now,” says Slainte the Owner of Terry O’Reilly Irish Pub. “I can tell customers want to stay, they don’t rush out the door or leave with a head ache! It actually helps increase revenue for my restaurant. The low profile panels make it so customers don’t even notice they are there!” This is just one of many successful restaurant acoustics that New England Soundproofing has done. We provide with complete custom acoustic panels for restaurants with hundreds of colors and fabrics to choose from.